In total, 40% of internet users have gone online in the past 12 months for one or more of these reasons. Throughout this section, we refer to these individuals as government data users. 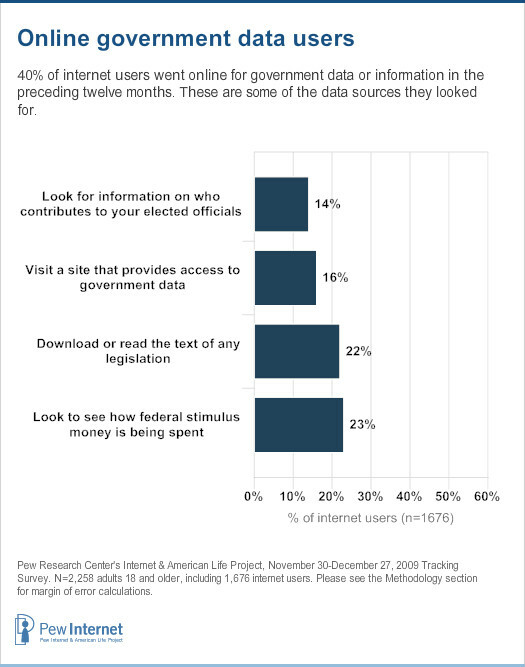 Looking into stimulus spending (23% of internet users have done this) and going online to read the text of legislation (22%) are the two most common of these activities.5 More than half of government data users (55%) have done two or more of these activities in the last year. Much like the government participatory activities we discussed in the preceding section, these online government data services appeal especially to high income, highly educated white males. Nearly half (48%) of government data users have graduated from college, and more than a third (36%) earn $75,000 or more per year. Government data users are also prolific users of various online technologies. Nine in ten (90%) have a high-speed home internet connection, three-quarters (74%) use the mobile web, 89% get political news online, 63% use social networking websites and 28% use Twitter or similar status update services. All these are significantly higher than for internet users who do not access government data online. Interestingly, going online for data or information about government activities is not associated with greater or lesser levels of trust in government. Government data users are just as likely as internet users who do not use these services to say that they trust their federal or state government “always” or “most of the time”, although they are slightly more likely to say that they generally trust their local authorities. However, they do show significantly higher levels of disapproval for the job Barack Obama is doing as president—42% of government data users disapprove of the administration’s job so far, compared with 30% of other online adults. This may be due to the demographic composition of online government users. Men, whites and high-income Americans generally have higher levels of disapproval for Barack Obama, and these groups make up a comparatively large share of the government data user population. Looking individually at the four activities that comprise our government data user definition, male internet users are more likely than online women to have visited any of the government data sites evaluated in our survey. 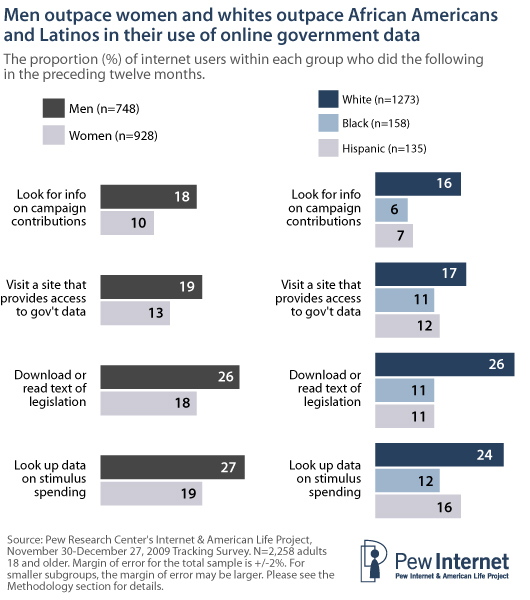 Going online for this type of government information appeals to men in a way that the other e-government activities we measured in this survey do not—generally, men and women use online government services at a similar rate. Among internet users, whites are also much more likely to have visited such websites in past twelve months compared with African-Americans or Latinos. The only exception is for sites such as data.gov that offer access to government data, for which there are no significant differences across racial boundaries. Among internet users, the use of these services also varies somewhat by political ideology and party affiliation. Conservative Republicans and liberal Democrats are especially likely to go online to look up stimulus spending (29% of conservative Republicans and 28% of liberal Democrats have done this) and political contributions (24% and 20% respectively), while political independents (19%) and liberal Democrats (26%) are the groups that are most likely to go to sites such as data.gov that offer access to government data. Overall, liberal Democrats are most likely to access any type of government data online (54% of internet users in this group are government data users, compared with 43% of conservative Republicans and 41% of political independents). In addition to asking internet users about their engagement with online services oriented around government data, we also asked all adults (both internet users and non-users) whether they feel that the federal government is now more or less open and accountable compared with two years ago. In part, we asked this question to see whether government data users feel that the government is more open and accountable, and there is indeed some correlation between the use of these services and attitudes towards government openness. 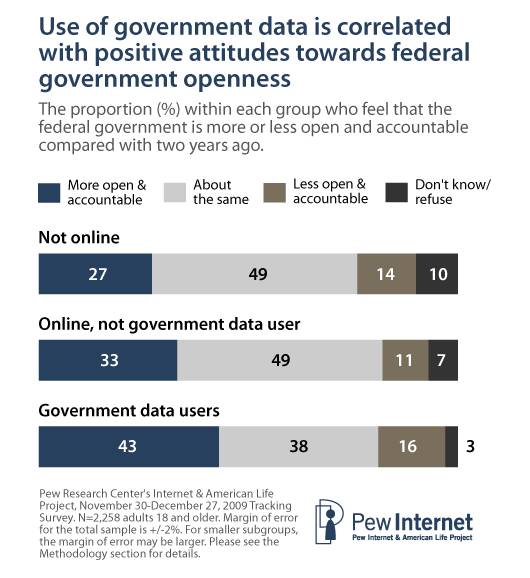 Two in five government data users (43%) say that the federal government is more open and accountable than it was two years ago, compared with 33% of internet users who are not government data users and 27% of those who do not go online. However, it is important to note that this association depends heavily on factors such as party identification and political ideology. Self-identified Democrats tend to have more positive views of the federal government’s openness and accountability if they also access government data online, while Republicans tend to have less positive views regardless of whether or not they are government data users. These associations persist even when we control statistically for factors such as demographics, partisan ideology, technology ownership and usage of other online government offerings. The same relationship holds for independent voters who lean towards one party over another. Among Democratic-leaning independents, 59% of government data users feel that the federal government is more open and accountable compared with two years ago, compared with 45% of such voters who go online but do not use government data and 29% of Democratic-leaning independents who do not go online. 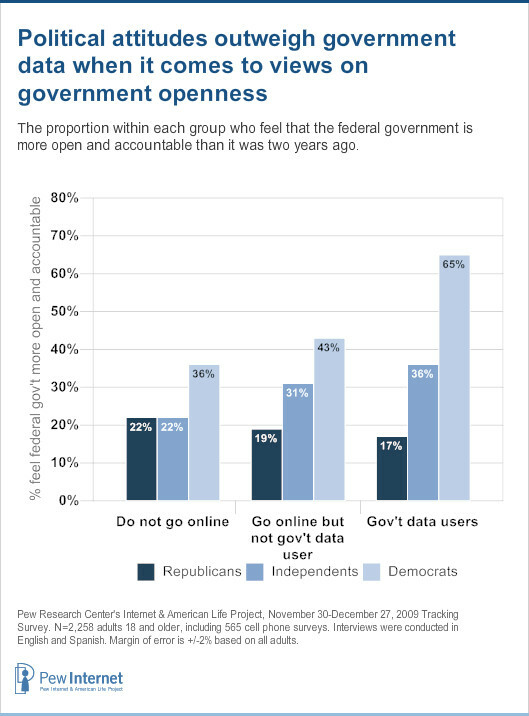 Among Republican-leaning independents, 26% of government data users have positive views towards the federal government’s openness and accountability; this is little different from the 21% of such voters who go online but do not use government data services who feel the same way. Put simply, political concerns trump access to data when it comes to one’s attitudes towards government openness.